N-vinyl imidazole (NVI) was grafted onto gelatin using potassium persulphate (KPS) as thermal initiator in aqueous medium. The effects of various parameters such as different KPS and NVI concentrations, the time and reaction temperature on the grafting process have been investigated. The optimum conditions were found to get the highest grafting efficiency as follow [KPS] = 6 × 10−3 mol L−1, [NVI] = 1.5 mol L−1 at reaction temperature 60 °C for 90 min. 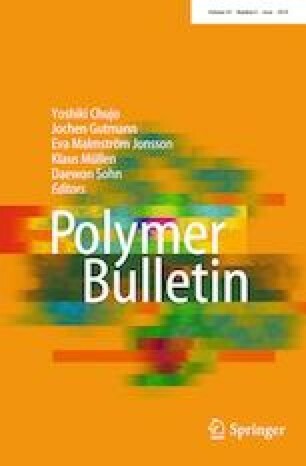 The grafted gelatin copolymers were characterized using different techniques namely Fourier transform infrared (FTIR) and 1H NMR spectroscopy, scanning electron microscope, X-ray diffraction (XRD) and thermal analysis. The antibacterial activity of gelatin and its grafted copolymers was evaluated. The highest percent of grafting (G% = 215%) showed strong improvement in activity of gelatin against gram-negative bacteria used Escherichia coli and Klebsiella pneumonia. In case of Klebsiella pneumonia, grafted gelatin copolymer showed the same inhibition zone of gentamicin (standard antibiotic).